It was a little cloudy when I got home yesterday, but I figured I could get a ride in before anything happened. Going up the road to WCC, there was a hot wind blowing me up the street. It was like someone following me with a blow dryer. I managed to get in a few laps before the first hint of the smell of rain reached my nose and the first hard drops stung my skin. I beat a hasty retreat home and just did some weights after putting the bike away. 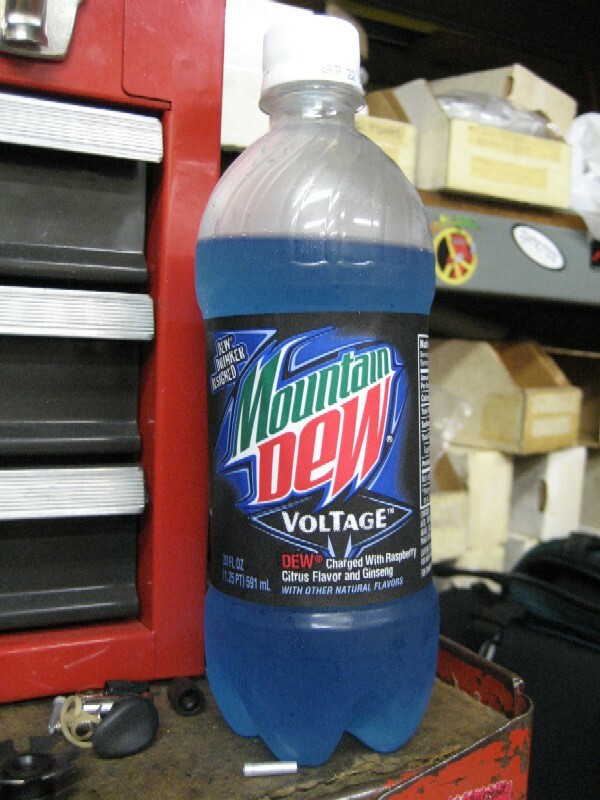 Finally had the last temporary Mountain Dew flavor, the darker blue “Voltage”. The label calls the flavor “raspberry/citrus”. It’s about the same sweetness as “Revolution”, so it is sweeter than “Supernova”. The raspberry flavor is the predominant one, but that is more a smell than taste thing. If you pinch your nose, the citrus comes out more. There is less of that chemical aftertaste than “Supernova”. Not bad. Better than “Revolution”? Hmm… Definitely better than “Supernova”. I’d probably pick this one as my favorite of the three if pressed to choose one. It is the most “Dew-like” since it has a citrus base flavor. Between this and a regular Dew, I’d take the real Dew! No unruly herd of entropy riders to deal with – Just me, smiley security guard, and 3 strollers. Fun in the afternoon! 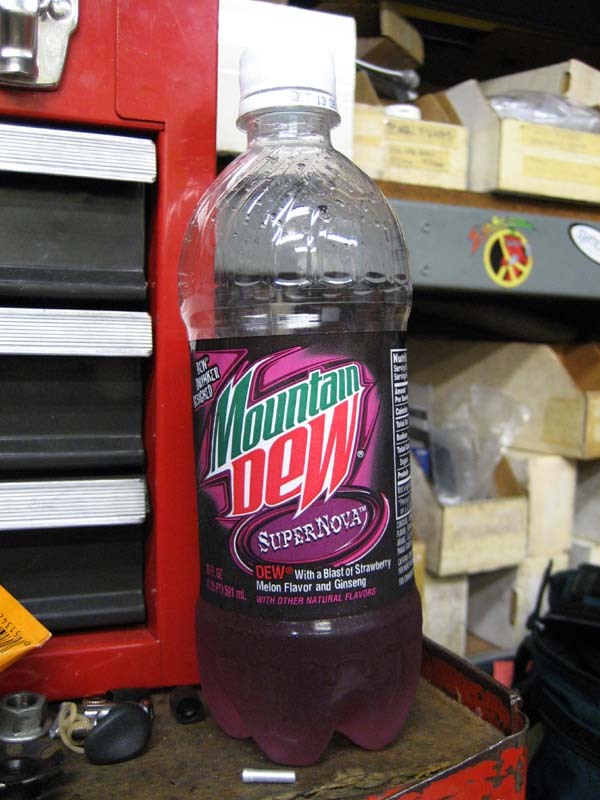 Tried the next temporary Mountain Dew flavor, the purple “Supernova”. Supposedly is “strawberry/melon” flavor. It’s not as sweet as “Revolution”. There is a muted strawberry soda taste, but the melon part gets lost. Like cheap store-brand strawberry or grape soda, it leaves a bitter chemical aftertaste in the back of the throat. Again, a lot of the experience is olfactory and not taste (pinch your nose and take a sip – you’ll see what I mean). 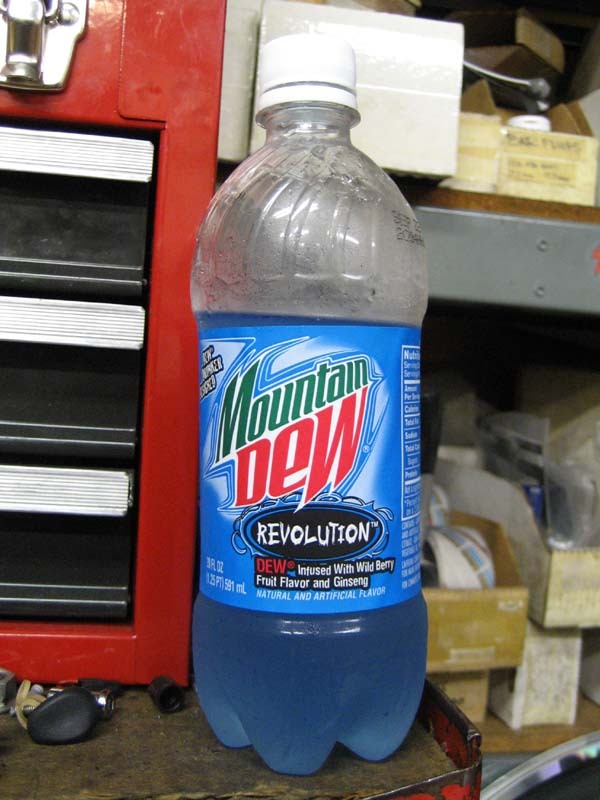 Not bad, but not as good as Revolution, and it still isn’t Dew. One more flavor to go! I finished up some stuff to upload today, but it’s all bright and sunny on the H3 cameras, so I’m ditching town-side and am going for a ride! Got thirsty at arubaito. Tried the new blue Mountain Dew. It’s the lighter blue one of the current three temporary flavors. Supposedly is “wild berry” flavor. It’s sweet and full of artificial berry goodness. A lot of the experience is olfactory and not taste. Not bad, but it isn’t Dew (and by that I don’t mean the same “isn’t Dew” as Canadian Mountain Dew either). The other two flavors are “Supernova” (purple, strawberry/melon flavor) and “Voltage” (Windex blue, raspberry/citrus flavor).